Volumes have been written about the possible beneficial (and negative) effects of self-driving cars and systems. But few have studied what industries will be disrupted by the transformations as self-driving devices begin to provide for our transportation needs. The stakeholders are numerous and the effects can be devastating. Think secretaries, airline reservation agents, and others disrupted during the emergence of the digital era. The transition to self-driving vehicles and car-sharing systems is likely to cause similar worldwide disruptions. Self-driving vehicles are penetrating a wide variety of industries – from factories to warehouses to underwater and into the skies. For the purposes of this article, the focus will be on cars, trucks, and public transport. Consider the insurance industry. If accident rates go down by 90%, as many are predicting, premiums will need to go down too because the reserves for payouts, which are built into the rates, will go down as well. Also, there will likely be fewer insured drivers and car owners thereby lowering the pool of insured people. Consider hotels and motels and their real estate values and employees – particularly those along the major highways. Why stop at a motel when you can sleep comfortably in a long-haul driverless car? This will likely effect short-haul airlines and airline employees as well. Think about professional drivers – truckers, taxies, limos, buses, shuttles. 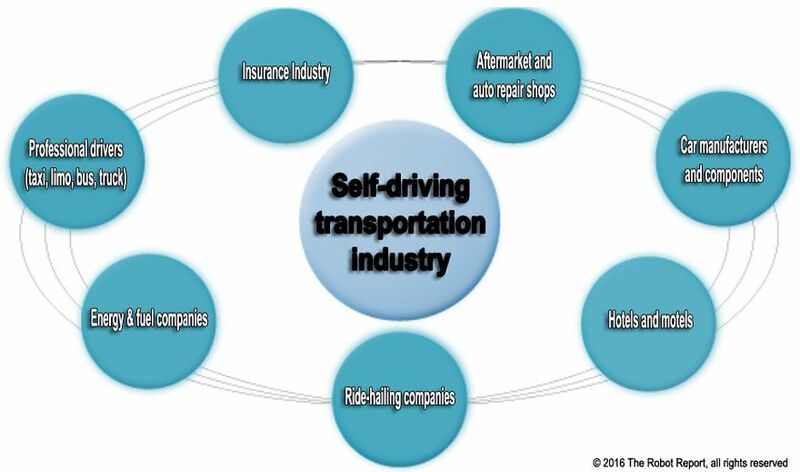 It is expected that many will be replaced by on-demand point-to-point self-driving devices. The list goes on and on. Insurance companies – as demand for insurance goes down as risks of crashes drop, insurance companies will lose revenue from this segment of their business. Auto repair companies – fewer accidents will mean fewer trips to the repair shop. Professional drivers (taxi, limo, trucking) – as demand for drivers gets reduced, there will still be a need for more highly skilled drivers and fleet managers. Hotels and motels – drivers will be able to sleep in comfortable long-distance cars as they zip along the highways. Domestic and short-haul airlines – many people will choose to take a comfortable car ride instead of going through the many hassles of air travel. Aftermarket and auto parts – as smart driving and assistance software and systems get deployed, there will not only be fewer accidents but less need for replacement parts and aftermarket upgrades. Ride-hailing companies – will Uber and the others be able to make the transition to owning their cars and managing the ownership aspect of fleet management? Or will the car companies fill this need like GM is planning to do with their deal with Lyft to combine GM’s fleet production and management with Lyft’s point-to-point service? Public transportation and rental cars – buses have fixed drop-off points whereas ride-hailing companies can go point to point. Why walk that extra distance? And why rent a car when you can just as easily call for a self-driving vehicle? Parking garages, lots and street spaces – long-term parking will descrease as car fleets are continuously on the move. Reshaping street spaces remains to be imagined. Fast food companies – at present, 70% of McDonald’s US revenue comes through the drive-thru window, thus they and other fast food companies, particularly those near highway exits, will take a big hit. Energy & petroleum companies – although the mix of energy used to fuel self-driving cars may shift to electricity, researchers are predicting that the driverless car era will actually consume more energy. Real estate – fewer gas stations and garages may just be the tip of the iceberg. Since commuting will be faster and easier, residential property value will shift from urban to suburban areas. 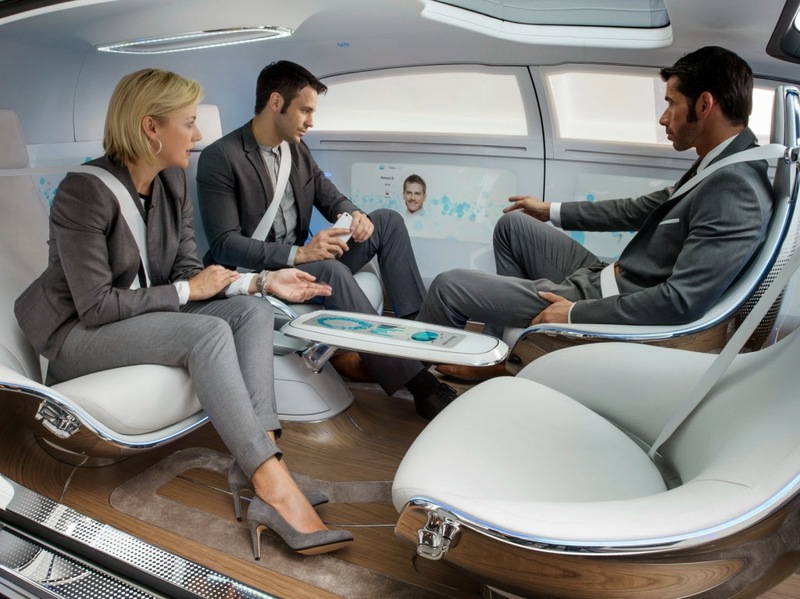 Media & entertainment – concept self-driving cars, like the Mercedes one shown above, will have screens for people to watch movies, read and see the news, and provide a more relevant time spent commuting. Car manufacturers – although there’s time for car companies to adapt to the new reality of self-driving devices, many serious and disruptive changes are likely to happen: fewer consumers will own cars, and, although Uber and the others will have bigger fleets with corresponding fleet economic efficiencies, the overall number of cars produced will go down as car-sharing increases utilization. What do you think? Stakeholder changes are a big topic in any industry, particularly in self-driving. What are your thoughts?